Today’s journey was to Nazareth. The population of the town is city is Arab - both Christian and Muslim with the people of each faith living and working alongside each other quite happily for many, many centuries. It is a city that has seen much improvement in infrastructure over the past twenty years or so and it has a relaxed feel to it – quite different to Jerusalem. Outside the Basilica, the internal walls of the ‘compound’ are decorated with images of Mary created and gifted by various nations from across the world (these continue in the upper part of the Basilica too). Images of Mary with the infant Christ are also to be found in the Greek Orthodox Church of St Gabriel in the upper part of the city. Amongst the images is one in which the angel is holding out its hand in blessing to Mary, in whose womb is the infant Christ. I hadn’t noticed this painting before – I guess, because like so many others, I have looked over the ‘fence’ to gaze at the water below that bubbles up from one of the many springs in this area and from which Mary is believed to have collected water. Seeing this image reminded me of Damian Hirst’s Madonna exhibited some years ago at a Summer Exhibition at the Royal Academy in London. 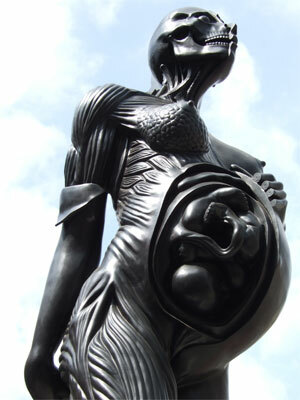 Considered controversial by some, I loved it – imaging as it does, a heavily pregnant Mary with Christ in her womb. Her breasts are ready to give milk for Jesus to feed on, and there we see the Incarnate God waiting to be born in the form in which his ministry would be seen and we could come to know him – the Word made flesh indeed. I love it when artists surprise and challenge (even if I don’t like what they produce to surprise and challenge!) This Holy Land is full of surprise and challenge – for visiting the places in which Mary and Joseph lived and worked to care for Jesus, as well as the places where he taught and healed and prayed, bring surprise and challenge of their own. How will I respond? How am I being changed? What am I being led to think of, to pray for, to consider, to put aside… the answers to any of these questions will, if one is open, inspire and challenge in their own way.